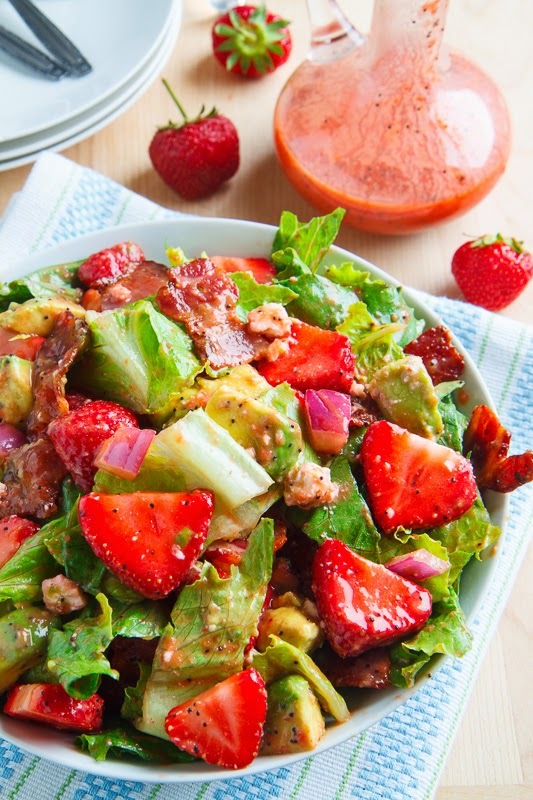 A strawberry and avocado salad with bacon, feta and strawberry poppy seed vinaigrette the will set your tastebuds tingling! 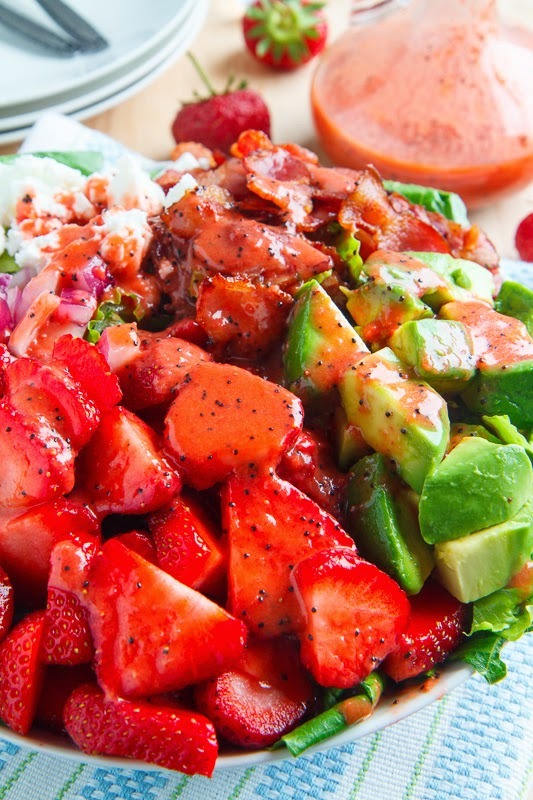 It’s time for another salad recipe and this time it’s a strawberry and avocado salad with strawberry poppy seed vinaigrette! 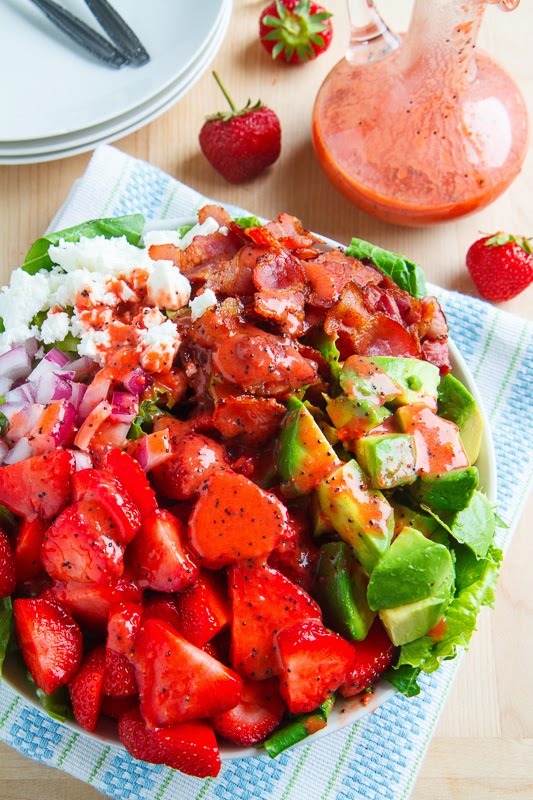 Strawberries work so well in salads and I find myself making them on a near weekly basis all summer long! 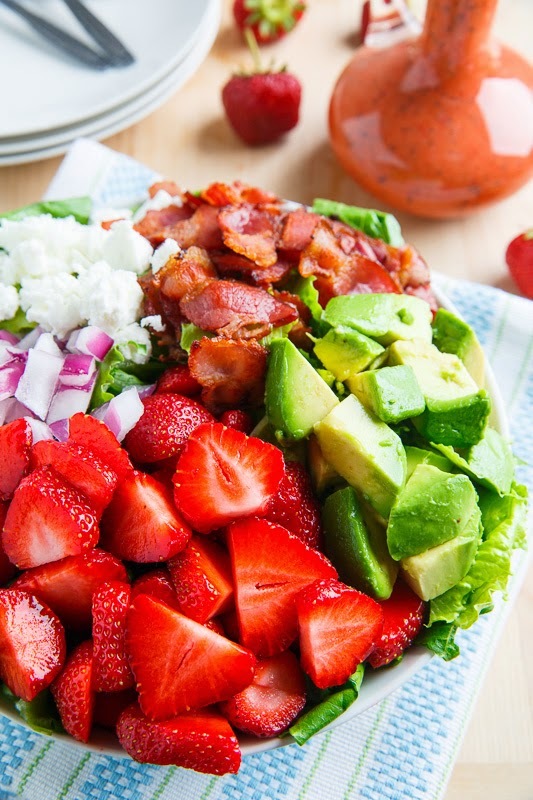 This salad combines so many of my favourite ingredients from the strawberries to the avocados, the BACON, and feta and the dressing is just so tasty and summery fresh! 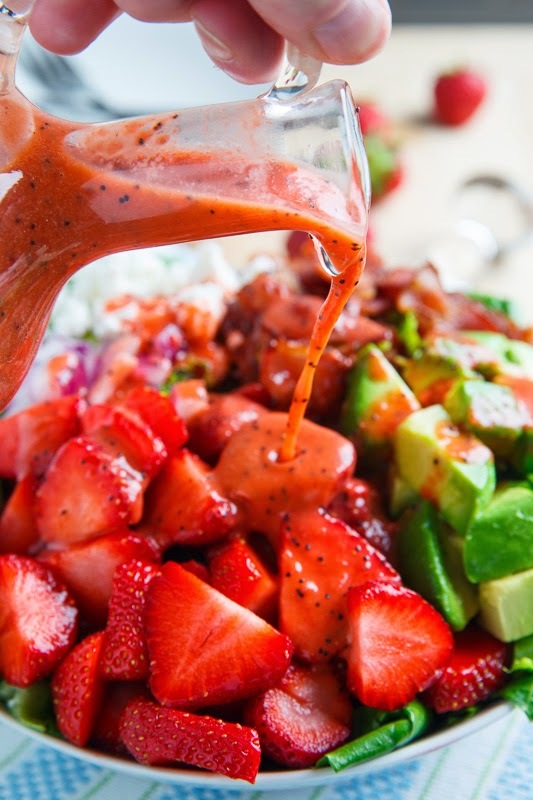 The strawberry poppy seed vinaigrette uses fresh strawberries with white balsamic vinegar, honey, tamari, mustard, garlic and a touch of sriracha for some spicy heat and it is just perfect on this strawberry salad! I could drink this strawberry poppy seed vinaigrette all by itself, but it is so good on this salad! The salad may look better all nicely assembled like above but it certainly tastes better once all mixed up! Cook the bacon until crispy, drain on paper towels and crumble. Assemble salad, toss with dressing and enjoy! Option: Replace the feta with goat cheese or blue cheese. Option: Add toasted and chopped pecans or walnuts. All of these flavors are SPOT ON. I love this salad Kevin! Totally trying this salad this weekend! This salad looks so delicious and fresh, Kevin! What a great idea for a summer salad! Thanks for sharing your recipe! Such an incredible summer meal! Kevin, this looks amazing! I'm going to have to make this soon! What an awesome salad full of flavors and colors!! Perfect for summer! What a gorgeous summer salad! I love strawberries with avo. I made today for lunch and boy was it delicious!!! Tanya Walker: I'm glad you enjoyed it! Just made this for tomorrow's family cookout. Amazing! I have a new favorite dressing. Also made your blackberry hoisin BBQ sauce for our ribs. Can't wait for tomorrow's feast. LOVE your recipes Kevin!